Institute's Aaron Jarvis scored the winner against Coleraine. 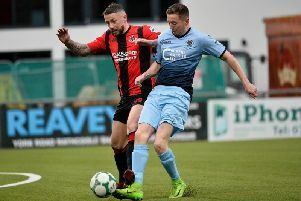 The victory moved Stute above Dungannon Swifts and level on points with Glentoran for that all important seventh place, which would secure a European play-off spot. With five games remaining Jarvis believes the pressure is now off Stute and they should go and enjoy their final matches of the season.